Microelectromechanical systems (MEMS) hold great promise for sensing and actuating on the micron scale. There is a hierarchy of increasing difficulty for placing MEMS devices in the field. Devices that do not allow contact between structural members rely mainly on mechanical properties of freestanding films. High-resolution techniques must be developed within the framework of MEMS to measure properties such as modulus and residual stress. When contact and rubbing contact are allowed, the complexities of adhesion and friction at the microscale must be understood and well controlled. Fluid interactions are similarly important for microfluidic devices. Packaging of MEMS for use in the field also requires special consideration, because it is often application specific. 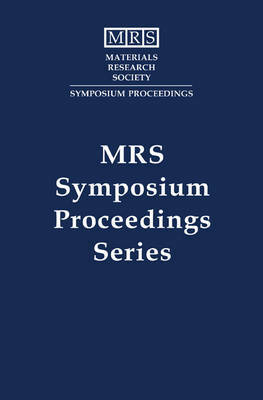 This book investigates various materials, characterization methods and processing techniques. These approaches represent different but useful strategies to solve MEMS challenges, and must be integrated for product realization. Topics include: deposition and characterization of Si; materials and processes for MEMS; tribology; dynamic optical characterization; packaging; LIGA; materials aspects; and characterization of MEMS processing.